If you recall (and I bet you do), we got pretty engaged with City Council earlier this year around changing some restrictive city code that was endangering some of Charlottesville’s smaller venues. In the end, Council was receptive to a lot of the ideas we brought forth and we got a largely positive result, albeit with some not-so-sensible restrictions remaining in the Belmont area. Now, in that case, the facts were on our side, we had overwhelming community support, and it was pretty obvious to everybody involved what needed to be done. Next time might not be so straightforward though, and the point of that little anecdote is to highlight the importance of electing a progressive, arts-friendly Council. Of course, while that issue should be near and dear to the Nailgun constituency, it’s hardly the only or most important thing that City Council will face in the near future. There’s also the never-ending parkway/bypass battle, the dredge versus dam debate, as well as increasing poverty, joblessness, and homelessness, to name a few banner issues. Well, tomorrow (Saturday, August 20th), seven candidates are competing for three slots in the Democratic primary for City Council which, given Charlottesville’s Democratic leanings and the likelihood that Democratic candidates will be chosen in November, is a big determining factor in the Council’s eventual makeup. That’s not, of course, to count out candidate’s running as independents or from any other party, who will have the opportunity to make a showing in the general election in November. Charlottesville City Council candidate forum from Charlottesville Tomorrow on Vimeo. Voting is from 9AM to 7PM at Burley Middle School on Rose Hill Drive. And if somebody wants to give me a ride, that’d be cool! And then, for something entirely different. For those seeking refuge from the flood of students pouring on campus, and the deluge of Dave-heads on the mall, pop up to the Tea Bazaar for something entirely less… well… awful. In fact, it’ll be pretty great! Leading off the night are Lynchburg’s The Late Virginia Summers, who play lush, delicately composed, instrumental jams; then it’s Matt Northrup from Greensboro, NC who is both an all-around solid dude and a one-man guitar-loop-shredding badass; and closing things out is Great Dads — aka Adam Smith and Steven Snider riffing really fast and furious on some tight rock numbers. I know it can be a little tough to keep track of all those dudes’ various projects, but trust me that this one is 100% awesome. So, if you think that all sounds like a good time, well… you’d be right! 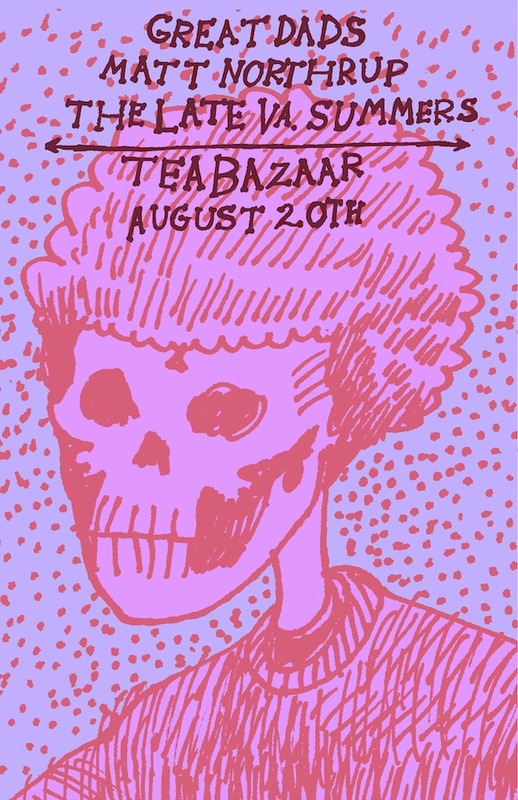 This all kicks off at the Tea Bazaar at 9PM and for just $5. Just a couple notes: If you are a registered voter in Charlottesville, then you can vote. You don’t need to be a registered Democrat or anything else. So if you’ve voted here before, or didn’t but are registered anyway, then you can vote! Also, bear in mind that only ~1600 people vote in this election, which is a wildly small number. So by default, your vote makes a big difference! Jacob, nearly 300 people voted in the absentee round, so I predict those numbers will approach at least 2,500. In 2009, just over 1,600 voted, but that was without all the passion that’s been in this race. Stop by our tent and say hello! Sean, good to hear that interest is high in this election, and thanks for the update! For our readers’ sake, it’s still worth noting that 2,500 is still an incredibly small number and votes count big-time in an election like this one. Just 50 people reading this and voting equals 2% of the electorate, which is enough to swing the vote to one candidate or another.